What impact has ‘austerity’, the cuts in public spending by the UK Coalition government since the 2010 general election, had upon a council estate community in Birmingham? This question will be considered in the context of the American psychologist Urie Bronfenbrenner’s ecological model of systems, originally created to help psychologists understand the many interwoven factors that influence child development. The social determinants of health – which include social class, poverty, unemployment and poor housing – have been well documented (Marmot, 2010). Social inequality is correlated with life expectancy and physical health as well as with a range of psychologically relevant issues, including: mental health problems, drug abuse, interpersonal violence, and reduced educational attainment and child well-being (Wilkinson & Pickett, 2009). Given this, we would expect ‘austerity’ measures to have an impact on individuals and communities. But what is the best way for us as psychologists to understand how such policies might shape the mental and physical health of the individuals and communities that are subject to them? In this article, I will be using American psychologist Urie Bronfenbrenner’s ecological model of systems (Bronfenbrenner, 1979), originally created to help psychologists understand the many interwoven factors that influence child development. I Macro level: on a larger scale determining the prevailing ideology and social structure within which the individual person and his/her micro-, meso- and exo-level systems operate (e.g. current rate of unemployment, other conditions of the labour market, gender roles in society, government policy of austerity). This outlook maps directly on to the community psychologist’s traditional concern with social power as the key to well-being and distress (Orford, 2008; Smail, 2006). This article is also informed by my own work on the estate over a 13-year period, initially as a psychologist with the Family Well-being Project (Harris, 2005). Examples of the implications of austerity will come from multi-agency meetings in the neighbourhood over the last six months of 2013. Bronfenbrenner’s approach allows us to track movements of resources within and between the different nested systems, and to consider the psychological effects of these changes on those involved. Neoliberalism can be summarised as the promotion of free markets and of the idea of individual responsibility for health and wealth (or poverty) as the best way of managing society’s resources (Harvey, 2005). These free markets are, in fact, unfairly skewed in favour of the rich and powerful (Usdin, 2007). At a global level neoliberalism has manifested itself in transnational trade agreements and policy making in a number of countries around the world. This is particularly the case in countries where there have been financial crises. Within this neoliberal ideology, public funding becomes a potential source of shareholder revenue. Corporations likely to profit from marketisation have been working with national governments to promote its benefits. Think tanks present, on behalf of their clients, the benefits of neoliberalism. See for instance Furness and Gough (2009): promoting the creation of a ‘thriving provider market’, introducing charges for health care for the wealthiest. This is a politically astute way of further opening up health provision to private corporations. It also reinforces the principle of charging for healthcare. The parameters within which health care is charged for could then be altered later. Dissenting voices are increasingly marginalised. Reed (2012), however, supported by Action for Children, the Children’s Society and the NSPCC, uses the government’s own data to conclude that the number of vulnerable families with children will grow (largely as the result of changes to the benefit and tax systems) and that the measures put in place to mitigate the impact of the recession (such as the Pupil Premium and the Troubled Families Programme) are insufficient to offset its financial effects. These financial effects are exacerbated by the disproportionately high use such families make of services provided by local authorities, which are being reduced through the austerity programme. Councils had their government grant cut by 26 per cent over the four years up to 2014 (HM Treasury, 2010) compared to reductions in central government budgets of 8 per cent. As well as being affected by the financial aspect of austerity, benefit-claimant families have also been affected by the associated political strategy. This strategy involves Coalition ministers, MPs and many journalists presenting such claimants as undeserving. These families are being subjected to a negative, global judgement by a socially significant authority, while also having few options to improve their circumstances (Harkness et al., 2012). Michael Marmot was recently moved to call these cuts in services and benefits ‘a grotesque parody of fairness’ (reported by Scally, 2013). The estate on which I worked was a New Deal for Communities (NDC) community regeneration programme, receiving £50 million from central government between 2000 and 2010. The local NDC delivery team supported the development of a local network of agencies at a monthly meeting called ‘Local Stakeholders’. The workers were from a range of organisations, including frontline staff of public sector agencies, such as health visitors, police, learning mentors and the housing department. Senior managers also attended when required and when available. A number of non-statutory organisations were represented, for instance Befriend – a charity that supported both newly arrived and established residents in building relationships in the neighbourhood. When the NDC funding ended, the local agencies continued to meet. These meetings are currently chaired by a neighbourhood coordinator from the city council. This forum has allowed workers to make connections with each other, to recognise how they are affected by and address issues that are ‘cross-cutting’, such as poor housing and domestic violence. For example, the forum had previously responded collectively to proposals for reduced local family support provision and to plans to carry out a significant housing regeneration scheme. At a meeting in June 2013 attended by 20 public service professionals from the statutory and third sectors, while attendees maintained their focus on sharing information and managing the scarce resources within the neighbourhood, there was clear evidence of the impact of the cuts on those within the meeting. A local day centre for older people is to be closed down. The regular users of the centre have been told that they will receive a phone call to tell them whether they will be able to access ‘alternative provision’ and if so where this will be. There is little social work support available to help people make the transition. Any such transition is likely to involve a number of demands, for example: leaving trusted relationships and establishing new ones; finding and then arranging transport to a new venue; possibly renegotiating a care package to take account of changing circumstances; setting new priorities when the new arrangements may involve reduced support; and possible feelings of guilt when friends do not get offered alternative provision. Staff at the meeting commented, ‘These are people’s lives you are talking about here – people [the council] aren’t interested – that’s what hurts me.’ The workers were clearly affected by their empathy for their client group as well as feeling let down by the decision makers in their organisation. They were sharing in the loss of their clients but they were also experiencing a loss of trust in their organisation, putting them at risk of burnout (Hobfoll, 1989). Their sense of fairness had been undermined: ‘we are not all in this together’, after all. This is likely to erode the quality of their work because it will reduce their ability to empathise with their clients, and just at the time when many of these workers will also have to be defensively protecting their workplace niche and may be preoccupied with searching for new, and more stable, employment. Many local families have children with special educational needs. They will be invited to become more involved in the planning of their children’s care and even hold part of the allocated budget through the Children and Families Bill (2014). For these families to make a successful transition to what has previously been part of their exo system and participate as ‘consumers’, they may well require the ‘support in kind’ of local authority staff – notably educational psychologists. This service has been reduced over the last financial year and now operates as a ‘traded service’ within the local authority. The estate in which the meeting took place was built between the 1950s and 1970s. The area is characterised by high levels of unemployment and high population turnover (up to 25 per cent per year according to local authority data), poor housing and residents who are often living isolated lives. Local workers refer to ‘low-level mental health’ problems that affect a significant proportion of the population. Thirty-three per cent of households in the area are lone parents with dependent children (2011 census). The proportion of pupils achieving five or more A*–C grade passes, including English and Maths, at GCSE or equivalent in the 2011–2012 year was 17 per cent, compared with a national average of 59 per cent. Public health initiatives in the area have suffered from poor recruitment and low achievement of desired outcomes (e.g. smoking cessation). Why have these initiatives largely failed? The workers find that there are multiple barriers to individuals making changes in their lifestyles. These hurdles include: social isolation, material deprivation and personal histories of abuse. Indeed, these programmes have seldom matched the requirements of disempowered residents, concerned with the need to feel safe (both inside and outside of their homes) and with managing day-to-day; all of which leaves them with relatively little time, money or energy to think about longer-term issues, like health and well-being. Residents have told us that the poorly maintained physical environment affects them and their families in various ways. They describe how their children’s expectations are affected by the rubbish they see littering the streets: ‘It gets into children’s heads’. Signs of neighbourhood disorder (e.g. 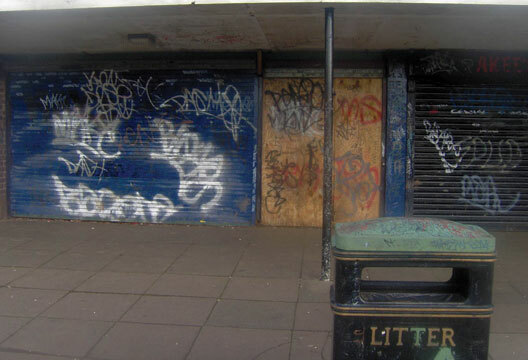 broken windows, burnt-out cars, graffiti) had been highlighted by residents on the estate as signs of social disorganisation, significantly affecting family well-being, as far back as 2004. Residents describe the shame they feel when people see where they live. With austerity we are likely to see increased levels of social displacement as families have to move to avoid the financial consequences of austerity policies. NDC’s own data shows that increased mobility has a negative effect on service delivery and on outcomes – especially educational outcomes. Increased mobility tends to lead to decreased social cohesion – residents feel they don’t know their neighbours. Markowitz et al. (2001) find that community cohesion reduces disorder and that disorder reduces community cohesion, a relationship that is partly mediated by fear. This displacement and mobility, combined with the reduction in local services, will further fray the social networks on the estate that are already under strain, reducing the ability and willingness of the remaining residents to informally monitor the area for criminal and antisocial activity. As the social and physical environment deteriorates, people may feel more insecure. They could experience chronically elevated levels of arousal causing depression and anxiety (Latkin & Curry, 2003; Taylor et al., 1997). Among pregnant women this can adversely influence fetal development with lifelong consequences for intellectual attainment and emotional and behavioural adjustment (O’Connor, 2003) – passing on disadvantage to the next generation. Indeed, the reduction in the number of social networks and agencies upon the estate will also shrink the opportunities for young people and families to connect with schools and health and welfare agencies, and to see them as trustworthy allies rather than as agents of control (Gillies, 2005). As these groups become even more marginalised from mainstream activities, they will simply accept, or not even notice, the reduction in social mobility that will accompany these changes, but which may nevertheless have a significant adverse long-term effect upon their life course. The ‘bedroom tax’ means that people with one spare bedroom will lose 14 per cent of their housing benefit, while those with two spare bedrooms will lose 25 per cent. For our Birmingham estate, according to the local authority’s figures, there were 51 households in the local ward who would be affected by these changes, 20 of whom are included in the Troubled Families intervention. Troubled Families, where children are not in school, parents are not in work and there is youth crime and/or antisocial behaviour, are then affected by another decline in their resources. Their attention will become focused on the more immediate challenges of day-to-day living and conserving the resources they still retain (Hobfoll, 1989): eking out their shrunken household budgets and struggling to find ways to pay their bills, keeping their children occupied and entertained (when there is no money to go on holiday or to afford trips to the cinema, for instance), dealing with welfare bureaucracies and officials, and negotiating the exchange of vital support and favours with family, friends and neighbours. This will leave fewer resources to dedicate to the requirements to get their children to fully benefit from (or regularly attend) school. There will be corresponding adjustments in the distribution of resources within the family micro-system. Children are more likely to have to fend for themselves, as well as to provide care and support to other family members. In our meeting we heard how 60 per cent of our local ‘underoccupants’ are in high-rise blocks. The local community development team had handed out 20 discretionary payment application forms to single men who had been using their spare bedroom for contact with their children. If their income is reduced, or they are forced to move to a smaller property, they and their children are likely to have reduced contact. The psychological impact of this measure is worsened by there being no smaller properties available for those affected to move into. As well as losing their homes these residents will be further disempowered by a sense of lack of control over their predicament. Their option is often to move into private rented accommodation with different, less secure, terms of tenancy: usually at greater expense to the taxpayer. In response to editorial queries, I sent a draft of this article to more than 100 individuals or organisations to see whether they believed there had been any positive consequences of austerity. Very broadly speaking, for all the negatives from the changes to services and budget reductions, it is probably worth considering that there are one or two unintended, but potentially positive consequences from the service de-construction taking place. I am starting to see a lot more innovation and new partnerships developing, as well as old, antiquated and irrelevant practices and modes of delivery being challenged and changed. Long-term this can only be positive, though there are short-term and medium-term effects. One response from a GP said that he had seen no benefits from austerity. One from a local public spaces charity described how the winding-up of a local youth charity had ended their collaboration. They believed that this will now mean that they can no longer provide a natural play area for local children and that children’s well-being in the area will suffer. Bronfenbrenner’s nested-systems model provides a useful framework for tracking the effects of austerity on a specific community. It helps us describe how this set of policies will, in many cases, disrupt the multiple contexts within which people develop. As residents internalise the experience of marginalisation, the consequences for their academic achievement, mental health, physical health and indeed life expectancy (to take just some of the more obvious indicators) are likely to be serious. Austerity will increase inequality within our society as a whole, to the detriment of the health and well-being of us all but especially the poorest, and the most vulnerable. As psychologists, we are in a position to understand how the effects of austerity will become embedded in the life experiences of children and families with inevitable consequences for their well-being. While we may see therapeutic interventions as the means to addressing some of the psychological outcomes of these issues, this approach can never be an adequate response (Albee, 1988: Moloney, 2013). It also means that we risk compounding disadvantage by labelling, pathologising, and thereby further marginalising, many who are having to manage in a situation created by social injustice. The question remains of how psychologists will respond to these challenges. Will we look outside psychology for frameworks to use to describe and analyse contexts, e.g. urban studies, criminology, or create our own frameworks using existing psychological methodologies in different ways? Will we continue to focus on a strategy of treating an ‘epidemic’ one case at a time, or will we argue for change at a higher level? Albee, G.W. (1988, October). Prevention is the answer. OPENMIND (Journal of the British Association for Mental Health). Furness, D. & Gough, B. (2009). From feast to famine: Reforming the NHS for an age of austerity. London: Social Market Foundation. Gillies, V. (2005). Raising the ‘meritocracy’: Parenting and the individualization of social class. Sociology, 39(5), 835–853. Harkness, S., Gregg, P. & MacMillan, L. (2012). Poverty: The role of institutions, behaviours and culture. York: Joseph Rowntree Foundation. Harris, C. (2005). The Family Well-being Project. In C. Newnes & N. Radcliffe (Eds.) Making and breaking children’s lives. Ross-on-Wye: PCCS Books. Hobfoll, S.E. (1989). Conservation of resources: A new attempt at conceptualizing stress. American Psychologist, 44, 513–524. Latkin, C & Curry, A. (2003). Stressful neighbourhoods and depression: A prospective study of the impact of neighbourhood disorder. Journal of Health and Social Behaviour, 44, 34–44. Markovitz, F., Bellair, P., Liska, A. & Jianhong, L. (2001) Extending social disorganisation theory: Modelling the relationships between cohesion, disorder, and fear. Criminology, 39(2), 293–319. Marmot, M. (2010). Fair society, healthy lives: Strategic review of health inequalities in England post-2010. London: Department of Health. Moloney, P. (2013). The therapy industry: The irresistible rise of the talking cure, and why it doesn’t work. London: Pluto. O’Connor, T., Heron, J., Goulding, J. et al. (2003). Maternal antenatal anxiety and behavioural/emotional problems in children. Journal of Child Psychology and Psychiatry, 44(7), 1025–1036. Orford, J. (2008). Community psychology. Chichester: Wiley. Reed, H. (2012). In the eye of the storm: Britain’s forgotten children and families: A research report for Action for Children. London: The Children’s Society and NSPCC. Scally, G. (2013). A grotesque parody of fairness. British Medical Journal, 347(7932), 17. Smail, D. (2006). Power, interest and psychology. Ross-on-Wye: PCCS Books. Taylor, S.E., Repetti, R.L. & Seeman, T. (1997). Health psychology: What is an unhealthy environment and how does it get under the skin? Annual Review of Psychology, 48, 411–447. Usdin, S. (2007). The no-nonsense guide to world health. Oxford: New Internationalist Publications. Wilkinson, R. & Pickett, K. (2009) The spirit level: Why more equal societies almost always do better. London: Allen Lane.